Princess Aurora (Elle Fanning) is helplessly drawn to the cursed spindle. Photo courtesy Disney Enterprises, Inc. In spite of a virtual feature-length stampede of CGI special effects, it's good old-fashioned movie-star wattage that stuns in "Maleficent." Disney's revisionist take on its own "Sleeping Beauty" almost certainly wouldn't have been made were it not for Angelina Jolie, whose extraordinarily striking presence recalls the Old Hollywood potency of Greta Garbo. If only the film around Jolie were worthy of her. Perhaps "Maleficent" could have been an extraordinary work of art, a la Cocteau's "La belle et la bÍte" had it been approached from a place of confident emotional truth-telling, narrative patience and visual poetry. The work of first-time director Robert Stromberg (a veteran of visual effects and art direction) manages some striking visuals suggesting that direction could have been possible, but even if he were Cocteau, he'd still be up against economics: This Disney picture is as much about brand-building synergy as anything else. After this origin story (a Hollywood addiction of recent years), "Maleficent" sets to replaying Disney's 1959 "Sleeping Beauty" (itself adapted from Charles Perrault's fairy-tale text "La Belle au bois dormant"). 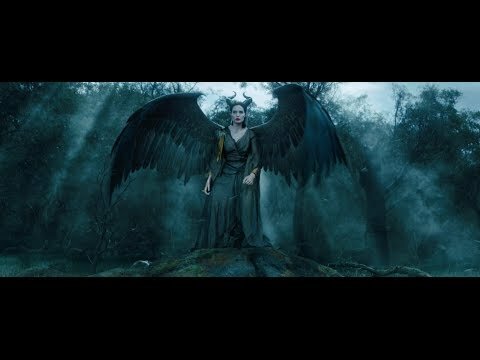 Ironically, "Maleficent" is unarguably at its most arresting in the scene that tinkers least with the source material: when Jolie, newly decked out as the villainous version of Maleficent, sleekly strides up to Stefan's throne and curses his infant daughter Aurora. Jolie has the scene for lunch, and the film comes roaring to life. She gets a little help from the traditional costume -- with its black drapery and imposing, devilish horns -- and Rick Baker's makeup design, which makes her already formidable cheekbones look like they could get part-time work as meat slicers. But we're not meant to enjoy this display (which prompts the reaction "You're the evil that's in the world") as much as we do, as the film's raison d'etre is to explain Maleficent's humanity. It's a noble cause to reconceive evil -- especially to children -- as just a person you haven't figured out yet, but some classic tales lend themselves more readily to such an approach than others (John Gardner's novel "Grendel" hit the sweet spot). The screenplay by Linda Woolverton (Disney's "Beauty and the Beast") next sends Maleficent on a journey of remorse for having misdirected her anger onto an innocent. The babe grows into teenage Elle Fanning, whose Aurora mistakes the ever-lurking Maleficent for her fairy godmother. Aurora has a date with a spindle, and maybe with Brenton Thwaites' Prince Phillip for a curse-ending "true love's kiss," but as the narration promises, this story is "not quite as you were told": Archetypal male conquest will lose, and the best of archetypal female power will overcome the worst of it. Plus a CGI dragon. Rated PG for sequences of fantasy action and violence, including frightening images. One hour, 37 minutes.